Proteins not only form the basis of life and perform functions in every system of the human body, they also make up $4.7B dollars in the Sports Nutrition Industry, which represents 70% of the total revenue in that category. 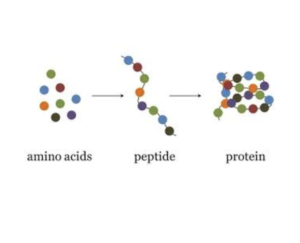 With an estimated 4 billion metric tons of food protein produced globally and predicted continued growth, proteins are arguably the most important substance within the testing industry. However, the most widely utilized protein testing methods do not adequately screen proteins for adulteration. In fact, historically there has been no direct analysis of proteins for identification. Instead, an indirect approach is used, which in turn allows product to be potentially adulterated with non-protein ingredients. 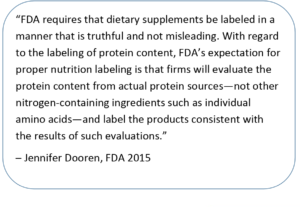 In 2015, Forbes Magazine said “A growing number of companies are accused of selling workout supplements spiked with cheap fillers that they’re passing off as protein.” In the five years following this statement, consumers have begun to demand more detailed information and transparency about their food and supplement proteins, while the testing industry has still struggled to stand behind statements made their labels. Dyad Lab’s Senior Vice President, AOAC stakeholder, and developer of a new LC/MS/MS/ method of protein testing, Dr. Spencer Carter, believes that consumers will drive the change that pushes brands to test their proteins more accurately. “As consumers get more educated, brands could be at risk of losing them.” Dr. Carter said. While public health is at risk, some “bad actors” in the industry driven by greed and economics are still pushing adulteration. Risk is also increasing for brands using inadequate protein testing methods as watchdog groups and public safety agencies are increasing activities to enforce label transparency. As consumers are being influenced by these types of events, and seek clarity, the FDA may be raising the likelihood of protein testing audits. While commonly used protein testing methods are accepted by the industry for now, the fact that they are not selective enough to detect various types of deliberate adulteration cannot be ignored. Due to the deficiencies of indirect testing methods, inexpensive substances can be used to increase nitrogen content and pass non-selective protein tests. Kjeldahl and Dumas are two of the most common protein methods, and neither could differentiate melamine, urea, or free amino acids from proteins because the tests used simply assume that the source of nitrogen is protein, when in reality it could be something entirely different. These inaccuracies have created scandals involving adulteration in anything from pet food to infant formula. Economics are the basis of adulteration. One example that shows the economic impact of testing within the protein industry is the estimated $94M that was lost when The EU reduced the accepted nitrogen-to protein factor for dairy products from 6.38% to 6.25 in 2006. Some labs are assuming measured nitrogen is coming from protein instead of other substances containing nitrogen such as amino acids. Others are identifying protein organoleptically by simply smelling or tasting it, which can be extremely subjective and too easy to fool. 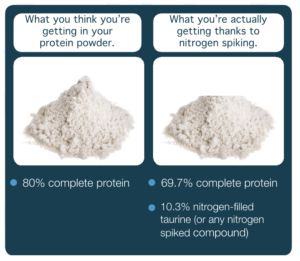 Using accurate testing technology for protein identification isn’t simple. One newer testing method involves using specific protein DNA to identify protein. Much like DNA was extracted from mosquito fossils to incubate dinosaurs in Jurassic Park, DNA can be extracted from target proteins to identify specific protein standards which are then compared to testing samples to see what proteins are present. This method requires the ability to identify exact species of protein in advance and assuring that the sample to be tested contains unbroken DNA. In the manufacturing process, DNA will often break down though, which makes analysis of proteins by DNA difficult. After examining all possible and widely used qualitative and quantitative protein methods, Dyad Labs (previously Genysis Labs) recognized the need for an entirely new method and developed LC/MS/MS methods for the identification of proteins in raw materials and finished goods that have the ability to detect protein more accurately than ever before. After comparing accuracy with other qualitative testing methods, tests show that LC/MS/MS provides more selective identification of proteins than other methods. Dr. Carter says that the legacy methods such as Kjeldahl and Dumas have been accepted for so long because the technology to replace them simply hasn’t existed until recently, “It’s amazing that the Kjeldahl method is still being used today,” he says of the assay which was developed in the 1800’s. To learn more about LC/MS/MS testing methods, contact Dyad labs today for more information. Dyad Labs (previously called Genysis Labs) was created as the in-house testing laboratory for a large contract manufacturer of nutritional supplement products. As nationally branded protein shakes, pre-workout drinks and other nutraceutical products sought confirmation that their raw ingredients used in the making of their products were exactly what they claimed to be; Dyad began the work of finding new and more accurate ways to identify, quantify and assess the purity and potency of ingredients and finished goods. Today, Dyad has evolved into a completely independent ISO/IEC 17025:2005 accredited contract laboratory offering a full range of chemical and microbiological testing services with the capacity to meet the rapidly evolving needs of the nutraceutical industry. With our brand-new Utah facility housing nine separate labs in over 30,000 sq ft., Dyad continues to provide transparent, specialized systems to exceed the testing needs of leading sports nutrition, direct selling, and food companies all around the world. Dyad Lab’s instrumentation capabilities include multiple Liquid Chromatography with Tandem Mass Spectrometry (LC/MS/MS) systems and ultra-pressure liquid chromatography (UPLC) with photo-diode array (PDA) and MS detection. They also include GC/MS/MS and GC/FID analyses; as well as trace metal and mineral testing services by Inductively Coupled Plasma Mass Spectroscopy (ICP-MS) and Direct Mercury Analyzer (DMA). Fat, fiber, glutens, nitrogen analysis, FTIR, water activity, density testing, stability, and several other chemical tests are also available. To learn more about Dyad Labs and our facilities, visit dyadlabs.com. Together, we are Dyad.